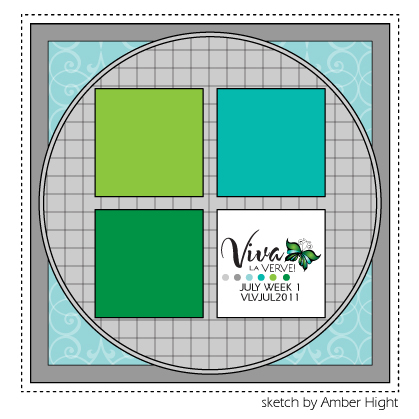 I will admit that Amber's July week 1 VLV sketch had me stymied. I just could not decide what I wanted to do with those 4 panels. I considered a flower in each one, a patchwork quilt approach, but it just wasn't coming together. So I decided to just wait on this sketch and use it with a color challenge or inspiration photo. Well, the stars must have aligned or something because when I saw this week's TSTR inspiration photo, I couldn't believe how well that wreath over the door fit the sketch. 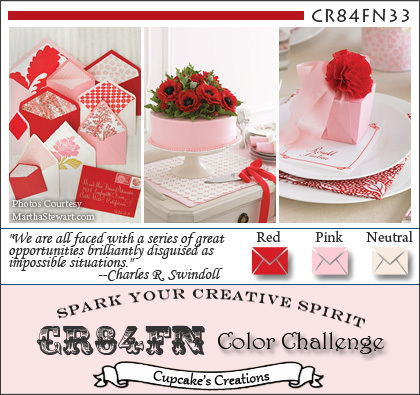 CR84FN challenge 33 also fits in using red, pink, and neutrals. Here's the sketch, inspiration photo, and color story. OK, so my idea was to mimic the panels of the door using some wooden sticks that I painted with crackle paint to make it just a little bit shabby. 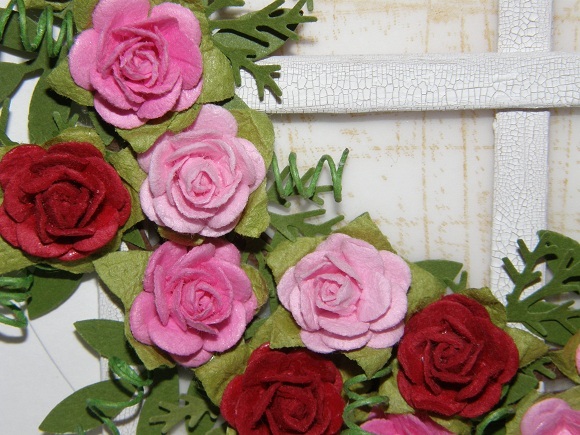 Then I assembled a little wreath using a bunch of Recollections mini roses placed on top of lots of MS leafy bits. The "window panes" are made of vellum. I stamped a SU! background stamp called "Sanded" on the back of the vellum to mimic the reflection of the trees in the window of the inspiration photo. In this closeup, you can see the crackle a bit more clearly. You can also see just a little bit of the base I made out of brown cardstock to mimic the grapevine of the actual wreath in the photo. I cut several circle Nesties and layered them so they would be off-set like an actual wreath. Then I just started gluing on the various leaf and fern punches and the flowers. 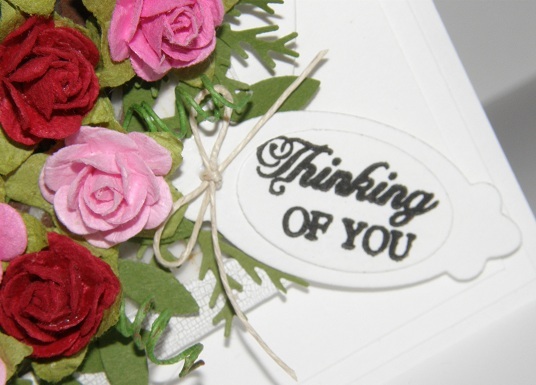 The little sentiment is from Verve's "Artful Elegance" and is cut out and mounted using two different Verve A Cut Above dies. I added a bit of thin twine to finish it as more of a tag. ETA: Thank you to the Shabby Tea Room for selecting my card to receive an honorable mention for this challenge! Wow, Sarah...what a beautiful wreath of gorgeous flowers! The colors are so pretty! You must have a metric ton of these flowers...and you always put every single one of them to good use! Great job, my dear! 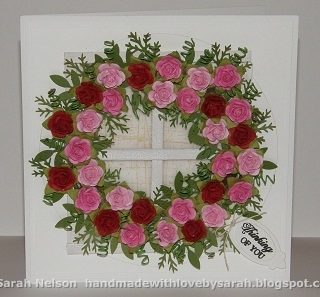 This is a magnificent wreath with wonderful roses and leaves!! Thanks for playing along with CR84FN! Your card is gorgeous!! It looks exactly like our inspiration photo! Fabulous work!! Thank you so much for joining us this week at The Shabby Tea Room! so pretty Sarah!!! great job on all those flowers! 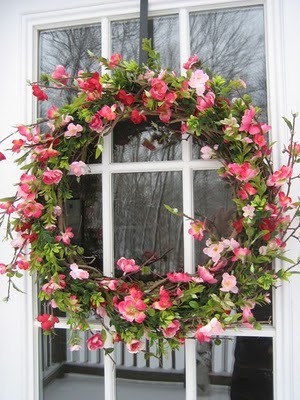 Oh my this is just so pretty, great window and terrific wreath!